The city of Chicago is very much a "green" city and achieves this goal by preserving its green spaces. The city offers year-round outdoor activities including the Taste of Chicago, relaxing on the beach, ice skating in Millennium Park, and running/biking the Lakeshore path. There is always something fun to do outdoors, as long as you are up for it! The Law School faculty members offer students a unique opportunity to bond with students in an educational environment through Greenberg Seminars. 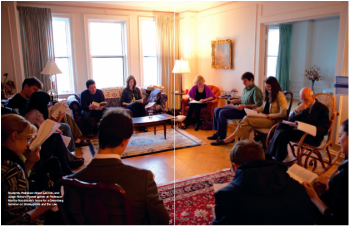 These are seminar classes meeting a few times each quarter in the homes of faculty members. The focus of the class depends on the interests of the professor: American foreign policy, graphic novels, and drug policy/criminal law as portrayed in the HBO series, "The Wire" are among some of the highlights of this series. Football? Basketball? Baseball? Hockey? 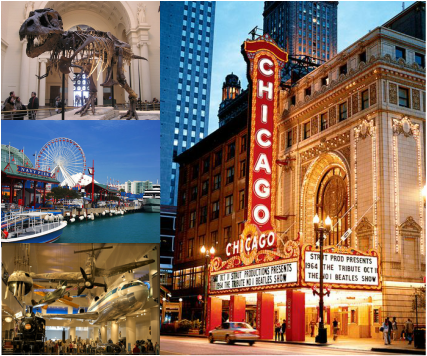 Chicago has it all, and much more! Home to the Bears, Bulls, Cubs, White Sox, and Blackhawks, Chicago is sure to have a professional sports team to suit your fancy! Second and third year students give students an opportunity to learn litigation skills, legislative advocacy, and transactional skills. The program is intended to join the academic study of law with experience in interviewing clients, investigating facts, developing strategies, conducting negotiations, dealing with adverse parties, drafting legislation and lobbying legislators, drafting contracts, and participating in court proceedings. One of the great benefits of attending Law School at the University of Chicago is the opportunity to study whatever your heart desires. The Law School allows students to pursue dual/joint degrees at the Booth School of Business, Harris School of Public Policy, and the School of Social Science Administration. Students also have an opportunity to pursue J.D./Ph.D. programs. At The University of Chicago Law School, not only do students love to learn, but the teachers love to teach. The faculty at the school is unparalleled, boasting among current and past professors the likes of President Barack Obama, Justice Elena Kagan, Richard Epstein, Douglas Baird, Cass Sunstein, Judge Richard Posner, Judge Frank Easterbrook, Martha Nussbaum, and Geoffrey Stone. The Law School is strongly committed to diversity, having designated January as the Law School's diversity month. Between the school and student organizations, various events focusing on the importance of diversity are held each year. These events include a dinner reception celebrating diversity, diversity coffee and wine mess, lunch seminars focusing on the importance of diversity in the academy, etc. While the Law School is occasionally referred to as a "conservative" place, the truth is that the school is a place that is very ideologically diverse. The entire religious, political, and socioeconomic spectrums are represented here in a way that adds to the educational experience. No question or viewpoint is shunned here, clearing the way for honest and open discussion on every issue. When looking at areas where students either come from or plan to begin their careers after graduation, many geographical locations are represented. This geographical diversity coupled with our small class size is an important factor to weigh while considering future employment prospects. For a more complete view of diversity at the Law School, please view our "Student Body at a Glance" fact sheet. The resources at your finger tips as a student at The University of Chicago are second to none! "Not only will students get a transformative legal education, but the overwhelming proportion of students who want a high-paying job in a major law firm will be able to obtain one. Similarly, the Law School’s recent creation of a public interest law program with generous financial support makes us extremely competitive in that sector as well." Please, don't take our word for it. Check out the data for yourself.